An NYRB Classics Original Winner of the Scott Moncrieff Prize for Translation 1915: Jean Dartemont heads off to the Great War, an eager conscript. The only thing he fears is missing the action. Soon, however, the vaunted “war to end all wars” seems like a war that will never end: whether mired in the trenches or going over the top, Jean finds himself caught in the midst of An NYRB Classics Original Winner of the Scott Moncrieff Prize for Translation 1915: Jean Dartemont heads off to the Great War, an eager conscript. The only thing he fears is missing the action. Soon, however, the vaunted “war to end all wars” seems like a war that will never end: whether mired in the trenches or going over the top, Jean finds himself caught in the midst of an unimaginable, unceasing slaughter. After he is wounded, he returns from the front to discover a world where no one knows or wants to know any of this. Both the public and the authorities go on talking about heroes—and sending more men to their graves. But Jean refuses to keep silent. He will speak the forbidden word. He will tell them about fear. 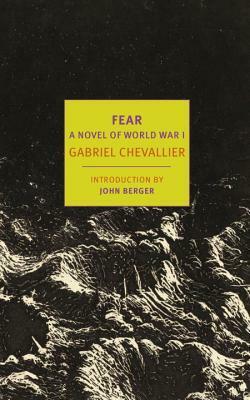 John Berger has called Fear “a book of the utmost urgency and relevance.” A literary masterpiece, it is also an essential and unforgettable reckoning with the terrible war that gave birth to a century of war.